This entry was posted in Other Equipment, Tennis Elbow, Uncategorized and tagged Sweet Spotter, sweet spotter tennis, Sweetspotter, Tennis Elbow, tennis elbow aids, The Sweet spotter by GGTennis. Bookmark the permalink. Within minutes I was dialing up Mr. Google to see what the heck my friend was talking about. It took me to a web site where I was greeted by the image of buxom brunette starring at a curiously shaped object embossed with a “Sweet Spotter” logo. So there it was, in full splendor and glory for the world to admire, but I remained confused. What is it? What does it have to do with tennis? Why does the buxom brunette appear to be so smitten with it? I went on to explore the web site more fully. I read about the origin of the device and learned it was created by a passionate tennis coach and former Davis Cup player from Cameroon and France who was schooled in engineering and is now a US citizen with multiple patents and inventions on his resume. As I continued reading and watching videos that explained the product I remained skeptical, but strangely intrigued. 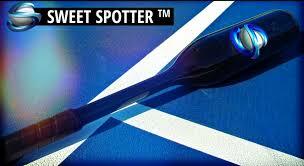 I came away from my online self-study having learned that the Sweet Spotter is a tennis improvement device that was inspired by a simple baseball bat. The re-engineered version is designed to blend some of the characteristics found in a baseball bat with some characteristics of a tennis racquet. The inventor boldly claims the device can assist players in developing and improving all phases of their game, (especially serve and return of serve), by sharpening the point of contact, improving timing, developing accuracy, building strength, and enhancing form. The site then goes on to detail the multitude of benefits through short narratives and multiple video highlights. The more I tried to be open to the concept, the more the claims began to make sense to me. (I still had no idea about how the buxom brunette fit into the picture.) I was especially intrigued by the notion that the Sweet Spotter could help a player with centering the ball thus reducing off-center hits. In my mind, this is the #1 advantage because if using the Sweet Spotter can help the tennis player achieve this objective, then there is a very real possibility that shock from off-center hits will be greatly reduced/eliminated. Eliminating shock, in most instances, will be a cure for those who are prone to arm/elbow discomfort. Bring it on! Growing more excited by the moment I reached out to the company. After a conversation, I was even more convinced the device needed to be examined more closely. I wanted to personally assess whether the claims were accurate and to see if my belief that it could be an aid to assist those suffering from tennis elbow had any merit. In a few short days my Sweet Spotter arrived. Honestly, opening the package made my day. When it arrived I unpacked it and found it carefully swaddled in an impressive tube shaped carrying case. Yes, the product is expensive. In fact, a quick search of some discussion boards showed the pricing to be the number 1 concern. However, I rationalized that if it lives up to even a small portion of the claims, the Sweet Spotter would be worth every penny and then some. When I removed it from the carrying case I swear I heard a heavenly Hallelujah in the background. The Sweet Spotter wreaked of quality, from the precise engineering right down to the beautiful paint job and visually appealing logo. I was so excited to give it a whirl I immediately began hitting some balls around the tennis shoppe. Okay…so I knocked down a picture and tagged our sheltie with some enthusiastic shanks, but it was my first experience and primitive as it was, the Sweet Spotter showed promise. Later that night I approached the tennis courts for my first attempt at taming this beast of a training aid. Just me, a bucket of balls, my Sweet Spotter and my trusty tennis racquet. I was there to experience serving with this training aid since I had no hitting partner. I set up at the service line and choked up high on the Sweet Spotter. I easily made contact, though directional control was less than precise. I gradually lowered my grip position on the handle and backed myself toward the baseline. Within less than 10 minutes I was serving with the Sweet Spotter. The process of getting to the point where I could strike the ball and maintain some control was not as challenging or time-consuming as I imagined it might be. Please do not take my comment out of context. I was expecting balls to be flying everywhere. I was expecting swings and misses. While making contact was not an issue, making proper contact was much more challenging and I freely admit to being forced to traverse both courts in order to recover my practice balls. However, all stayed within the fence. As my session progressed I became more proficient at making solid contact with the Sweet Spotter. When I made solid contact, the feedback from the device was pleasing to the senses. It felt good. Really good. Heck, let’s be honest…it was addictive type of good. With each stroke I found myself striving to find that magic point of feedback and I immediately understood what the informational web site meant when it talked about finding the O Zone and wanting to live there, but still had no idea as to the purpose of the buxom brunette. To end the first session I pulled out my racquet and began hitting some serves. At first the balls were finding the bottom of the net. My racquet is head light and the Sweet Spotter is head heavy. It took me a few balls to dial into the change in momentum of the device I was wielding. Once dialed in I noticed I was reaching higher, extending more and hitting serves with greater ease. I only hit about a dozen serves but I definitely noticed a difference. After the session, I could not get the hitting sensation out of my mind. The next day I was a little sore. I had obviously been working some muscles that typically do not get that type of work out. In spite of the muscle aches I could not wait to return to the courts and hit with the Sweet Spotter again. However, as excited as I am to give it another go, I have decided to postpone my journey. When I next go to the courts I fully intend to have video equipment in tow. My goal is to document the learning process via this blog as well as video recorded sessions. I am currently seeking a hitting partner to join on the journey. Ideally I would love to find someone who is suffering from tennis elbow, but is not currently inflamed. If I can not find someone who fits this criteria and is willing to go through the discovery process with me, I will instead look for either a player who has maybe plateaued at a certain level and is looking to improve or someone who is very skeptical to see if they remain skeptical or are converted. While not knowing precisely what the next step might be or when it will occur, (likely the start of the new year), resisting the urge to get out and continue working with The Sweet Spotter is going to definitely present a challenge to my self control. The urge is to get out there again. Hitting with it was extremely fun and although the initial session was limited, I believe I caught a glimpse of the potential for this device and it is exciting. Fortunately or unfortunately I am blessed with a sensitive elbow. One racquet I have enjoyed is the Yonex VCore 100s, but my elbow does not tolerate the stiffness of that frame very well. If I can not find a testing partner with elbow sensitivity I will use myself and the Yonex frame with full poly setup to test the theory of the device aiding those suffering from tennis elbow. While learning about this is my number one objective entering the test/trial, I will also pay attention to the myriad of advantages that the Sweet Spotter claims to produce and see if they have merit. I hope those reading the blog or who are interested in this training tool will continue checking in and also enjoy the journey of discovery. While I enjoyed the article very much, it is your sense of humor that was cracking me up. I had to look for the girl, she was at the bottom of the page, same question here. I would like to get one, but as you know, $180 buys a nice racket. I will be looking forward to your next adventure. OK so I gave up, I purchase one of these babies, may have to wait till spring time to use it out doors.